Open Europe: So that €750bn bailout was just a misunderstanding? So that €750bn bailout was just a misunderstanding? "I don’t think that the euro area was close to disaster at all – seen from the inside." "Seen from the outside, I would say that it’s always difficult for external observers to judge and analyse correctly the capacity of Europe to face up to exceptional difficulties." 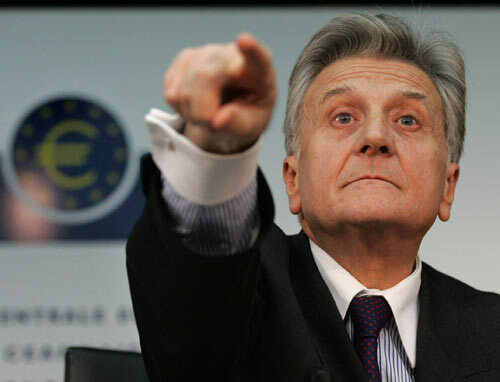 If only Trichet were right. Unfortunately it seems that EU leaders are still unwilling to admit to the fundamental failures of the EMU project - such as huge divergences within the eurozone and monetary union without fiscal union. Tightening budget rules is all very well, for example, but what about a country like Spain that wasn't in breach of them running up to the crisis? Until the eurozone elite faces up to this fairly simple and fundamental reality, the truth is that it is they that 'don't get it', not us mere 'outsiders'. "The pill doesn’t need sweetening"
"Europe at 27 is doomed to failure"
How could the 'referendum lock' be given teeth?